Well sorry Ricky but the cone head will soon be gone I promise! I have just started working on his hair so I think the side is close to the correct width but the top needs to be shaped and extended more towards the back I think. 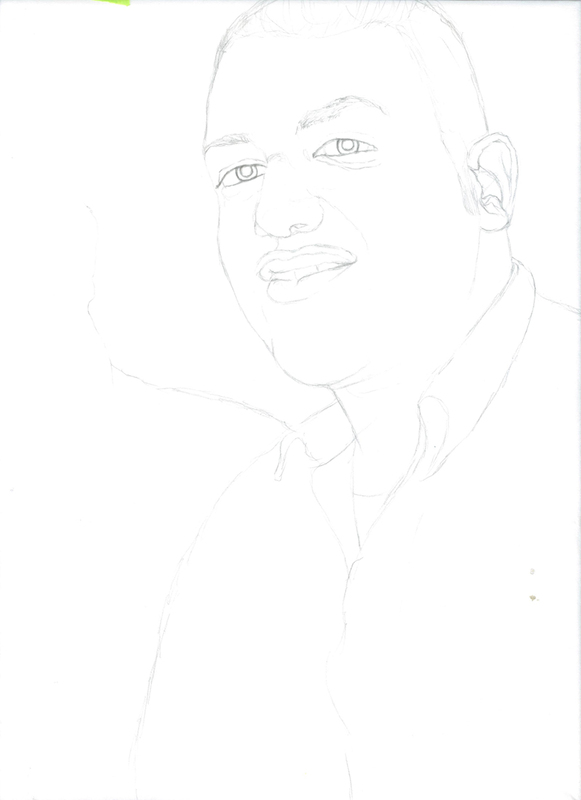 The photo I am using he has his hair shaved and the other photo his hair is at a totally different angle so I will make slow changes on the hair shape until it looks right. His chin is quite prominent right now but should settle in once it and the other areas of his face are refined further. His left eye (viewer's right) is a little off above the iris right now and will be shaped better for the next update. I have not done any further edits on Gagan yet. My client's are quite happy with him so far so I will continue to work on his resemblance until I am as close as I think I can get it. I also did a bit more work on Rocky. I think his eyes are pretty close now, just need to soften his lash line a touch and blend his brows in more so they look less cut out. 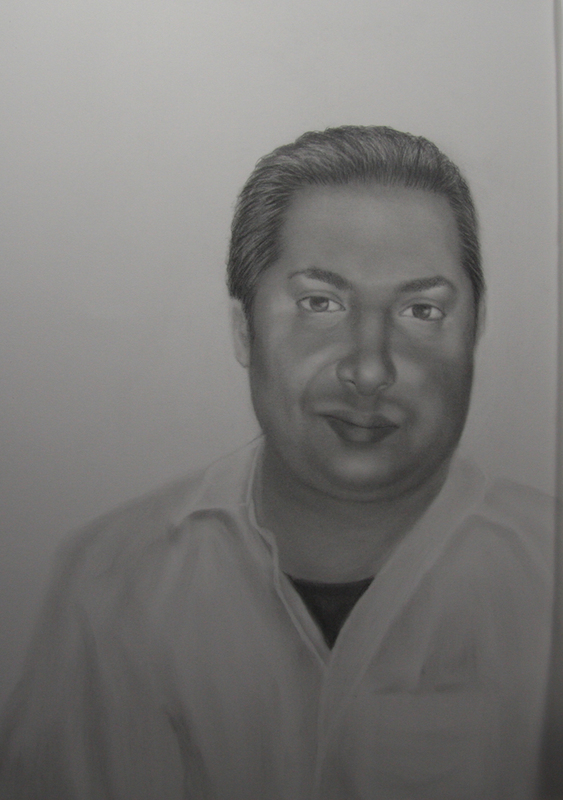 I have added a bit more shading to his cheek and hairline but I am not sure if it is correct, I will wait to hear back from my client on that. The photo I am working from his cheeks are more rounded so I need to refer to my client's expertise on this :) His lips looked fine until I saw them online and now I am thinking they are still too feminine looking. I think the highlights and cupids bow are a little too strong so I will soften them and see if that does the trick. So my client, Rocky & Ricky's sister, Gagan's cousin, did the Ride to Conquer Cancer this past weekend, rain, wind and cold so I hope it was a success and she can still walk today! Check out the CBC article and a link to the Ride to Conquer Cancer's website. 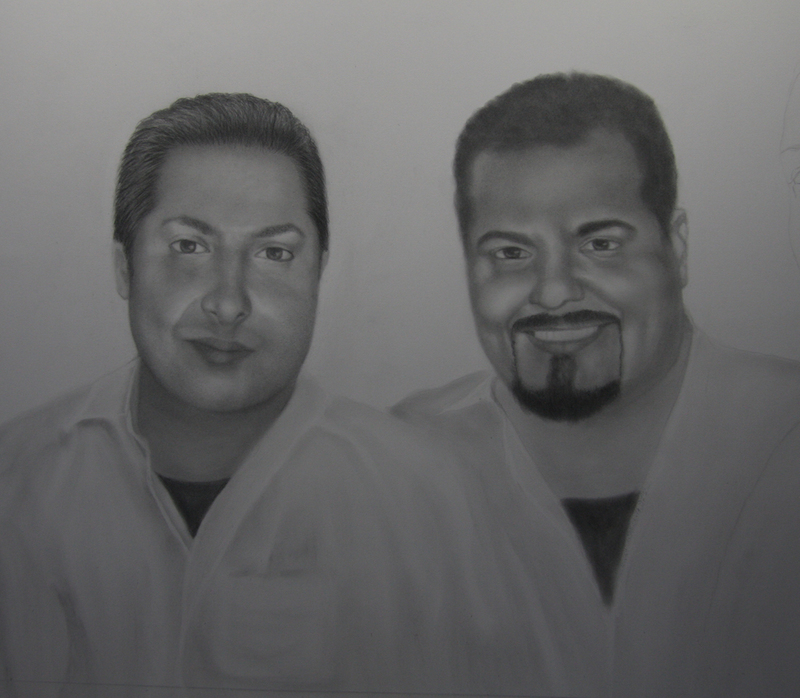 I have done very slight modifications on Rocky & Gagan and am waiting to hear back from my client on Gagan's portrait to see if she would like any changes before I go further on him. 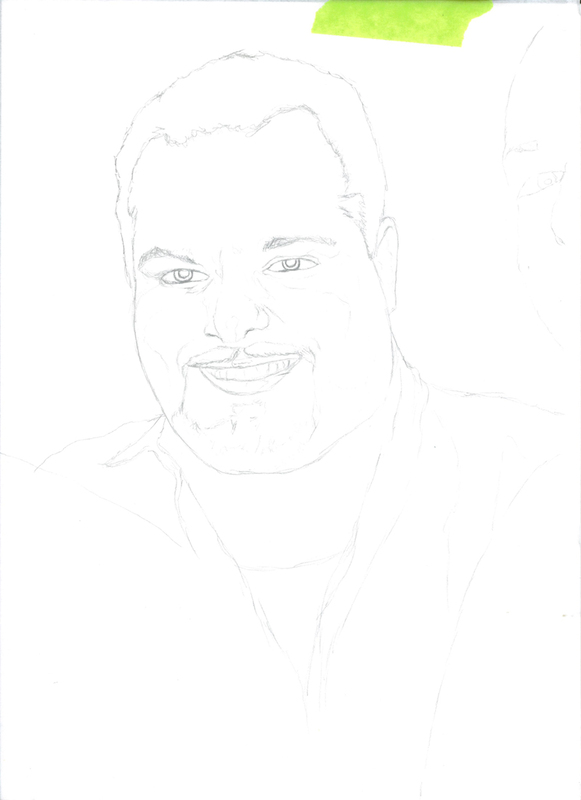 I am very loosely blocking in Ricky's face now without focusing too much on the details. I am trying to work from the general to the specific so working on the entire face loosely before going in and tightening up the details. 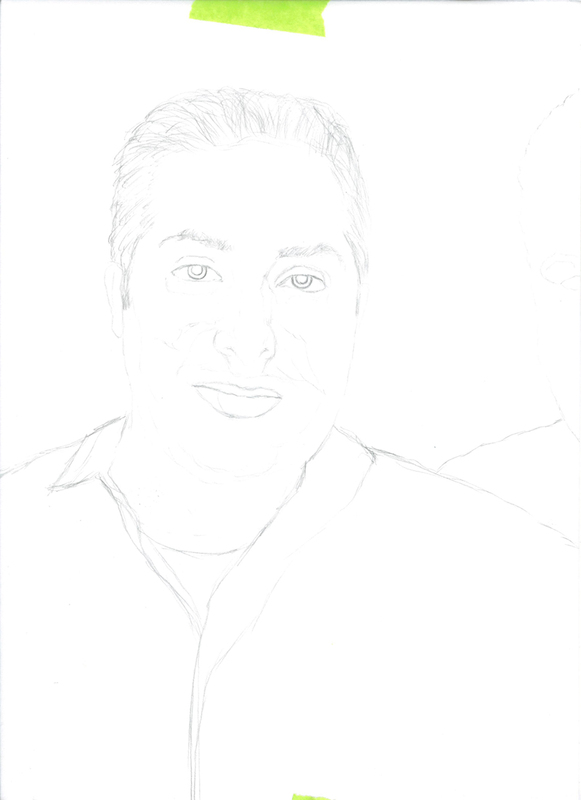 I have been giving Rocky's portrait a break for a bit and started on Gagan's. 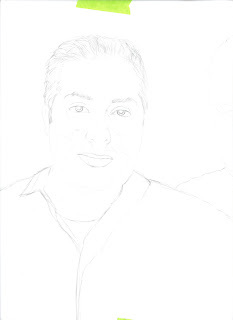 I think Gagan's portrait is roughly at the same level of completion as Rocky's which is the value ranges have been established and the form has been mostly built up, I would say about 80% complete for both? What is left is the more subtle work, refining the portraits and capturing more likeness, adding texture in areas and smoothing other areas to get a full range of texture and value. I know I said I would leave Rocky for a bit to get fresh eyes but ugh, I could not leave him in such a state! 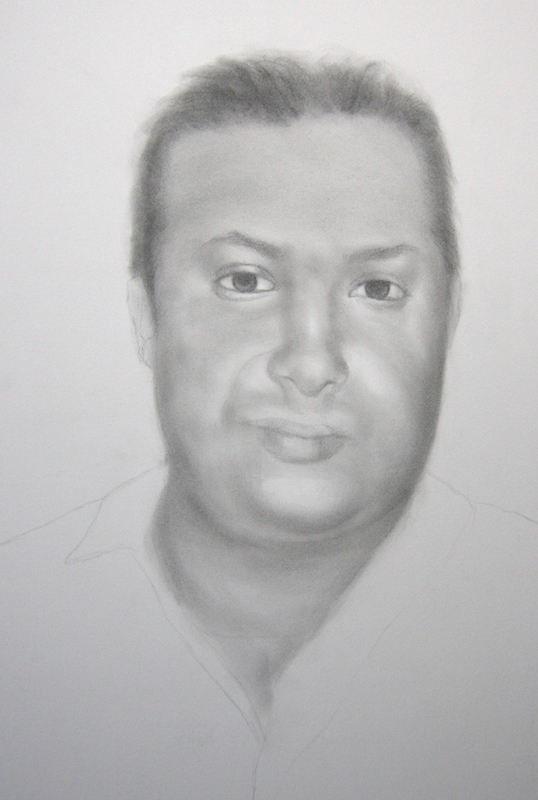 I have started pulling out the highlights and refining his facial features but things are still a ways off. I have removed his chin (thank goodness) as it really was throwing everything off and made it really hard to concentrate on the rest of his face. I think is right side jaw line could be slightly fuller but I will see what my client thinks. I think his left side is pretty close now on the jawline, once I have done more work on his lips and upper lip I will re-evaluate his cheek. I have darkened the sides of his nose a bit more but I think his right side especially could be darkened more in areas to give more depth and capture the shape more closely. The lips still need to be taken down a notch in value and blended into the skin more in areas. I think the bottom lip on his left side needs to be slightly fuller and the angles softened on his top lip. The stubble above his lip needs to be softened as well but it seems to not want to cooperate so I will let the paper settle a bit before softening further. I think the left side of his hairline needs to come in further, will check with my client as the photo I have does not really show his hair on that side. I felt it needed to be thicker and was thinking more on the outside of his head but now I am thinking if the hairline were brought in further to be more similar to his right side that may do it for the hair line. Then I can lighten and soften the values as it is looking a little cut and paste right now which is hard to look at! I have been working on Rocky's portrait for the better part of the date and thought I had better post an update! I am working from 3 different reference photos to try to capture his features. 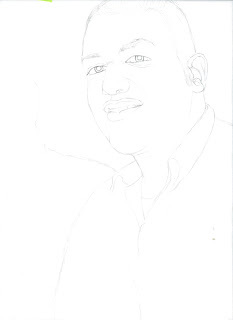 His hair still needs a fair bit of work but I did not go any further on it until my client has a look as the photo of the hair that I am using is a different angle than the photo I am using for his face and the photo I am using for his face, has his hair in a turban. So to make a long story short, I think the top may need to be filled out more and his right hand side of hair need to be filled out. 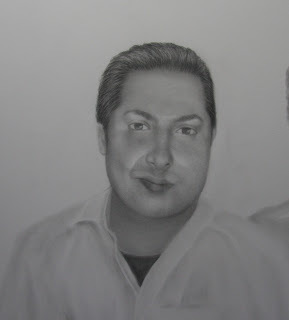 I also think his lips may be over pronounced but it is tricky to see in the reference photo as his lips blur into his skin so I will see what my client says about the shape before doing any further adjustments. His moustache stubble does need to be softened and the area just above his lips is a little too bright right now but I want to wait again on this for fresh eyes to make further adjustments. 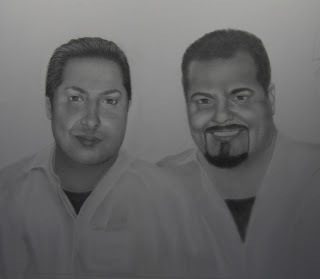 I am starting on the far left subject, Rocky, to avoid smudging of the graphite as each subject progresses. I have been building up the tonal values for his face and hair. It is better to build up the values slowly otherwise the glow gets lost from the paper reflecting through the layers. The resemblance is not great yet and probably will not be for at least a couple more updates as I am working on the overall shapes and then move onto the smaller details. That being said I have "locked in" his features slightly but they often get lost and need to be redrawn, but this re-drawing I find helps to get the features more accurate in the end. This is a rough sketch of Rocky the third subject in this portrait. His jawline did not pick up well in the scan so once transferred to the good paper things will be easier to see. 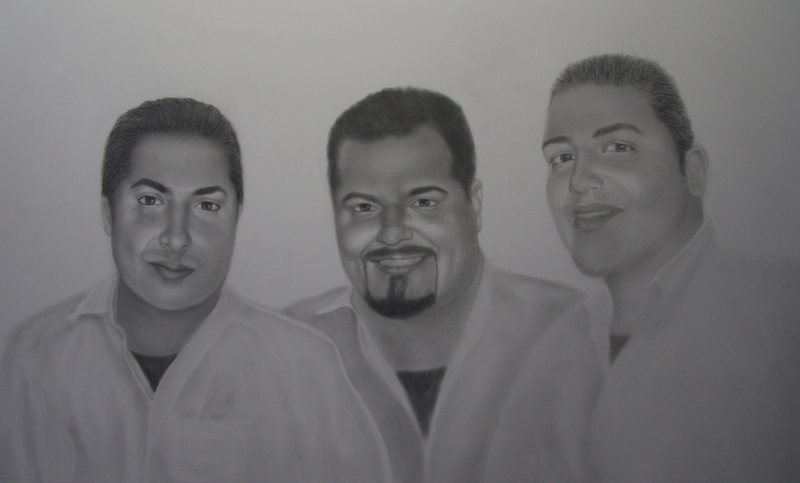 I will post another update of the three of them together which will again be the rough sketch but refined further. When transferring the rough sketch to the good paper so much of the details are lost and "off" so it always still needs to be refined again on the good paper before proceeding. It seems like a waste of time and I always want to just get on with it but the time spent now pays off later so I don't have to spend time making fixes on the good paper as much which can damage the paper and lose the freshness in the final piece. These are the rough sketches of two of the subjects for my upcoming graphite portrait commission. There will be a third subject, Rocky who is Ricky's brother that I am currently working on. Once the rough sketches have been completed on my tracing paper I will transfer all three of the portraits to the good paper and again refine the sketches before proceeding to the shading. I decided to try using tracing paper for my rough sketches so that I can use them as guides if needed as the portrait progresses. Always trying new tricks :) The final portrait will be 18x24" (roughly 13x19" image size).